Signature stamps reduce the strain on your hands during repetitive tasks like signing checks and documents. To order, click the Customize button below the product you want, click the Artwork tab, and then follow the Upload Image instructions. You can also e-mail us your signature. We accept pdf files and high resolution (300 dpi) jpg, gif, png and tiff files. Custom self-inking stamp. 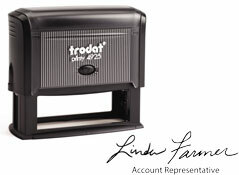 Impression area: 3/8" x 2-3/4"
Custom self-inking stamp, your signature with optional line of text. Impression area: 5/8" x 3"
Custom self-inking stamp, your signature with up to 2 lines of optional text. Impression area: 1" x 3-1/4"